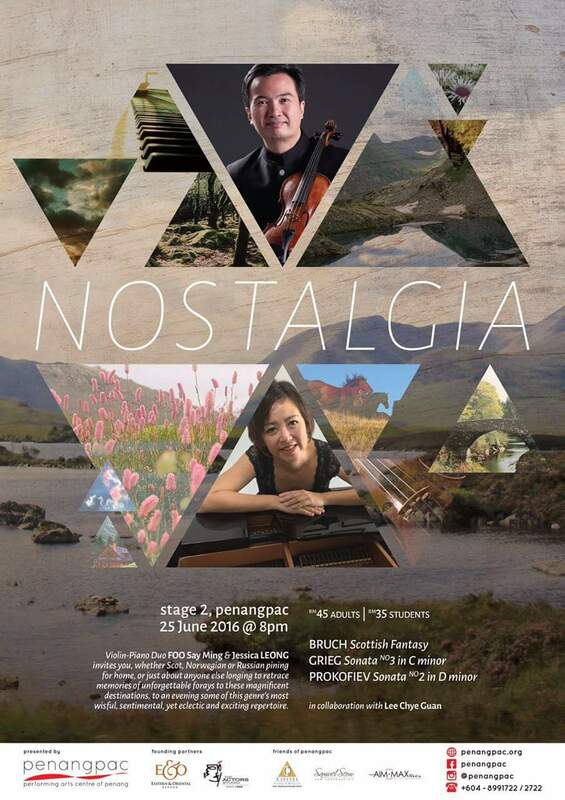 In a performance to tug at the heart strings and bring a nostalgic tear to the eye, two talented Singaporean musicians will take you on a tour of the sentimental best of classical music. Bruch’s 1880 “Scottish Fantasy” intertwines Scottish folk melodies; Grieg’s 1886 “Violin Sonata no3 in C Minor” is based on Norwegian folk melodies and rhythms; and Prokofiev’s haunting “Piano Sonata no2 in D Minor” was dedicated at its first performance in 1914 to a friend and fellow student at the St Petersburg Conservatory who had committed suicide a year earlier. Violinist Foo Say Ming walked away with the 1st prize of the Violin (Open) Category, the 1st prize of the Ensemble (Open) Category, and the grand prize of the competition: the Best Performer Award unanimously awarded by the judging panel of the 4th National Music Competition in Singapore in 1983, a feat which has yet to be equaled in the history of the country’s music competition. He studied at the Royal College of Music in London,and then at the Conservatoire de Lausanne in Switzerland. In 2012, he was appointed Head Of Strings at the Nanyang Academy Of Fine Arts (NAFA) School Of Music. A regular concert violin soloist, Foo Say Ming is also Assistant Conductor of the NUS Symphony Orchestra and various young musicians’ orchestras in Singapore, Malaysia and Indonesia. Jessica Leong Wai Yan began performing publicly at the age of fifteen, playing Gershwin’s Rhapsody in Blue with the Kuala Lumpur Orchestra. She studied piano in Hong Kong and Singapore, and recently completed her Master Degree in Solo performance with distinction at the Royal Scottish Academy of Music and Drama and Advance accompaniment, with distinction. She won the Academy’s concerto competition. She is now a free lance musician and accompanying mostly in Nanyang Academy of Fine Arts. The recital is on Saturday June 25th at 8pm at penangpac, Straits Quay, and tickets (RM 45) are available from their box office or at http://www.ticketpro.com.my/jnp/theatre/musical/1866379-penangpac-Nostalgia.html.